Cyberattacks involving zero-day exploits happen from time to time, affecting different platforms and applications. 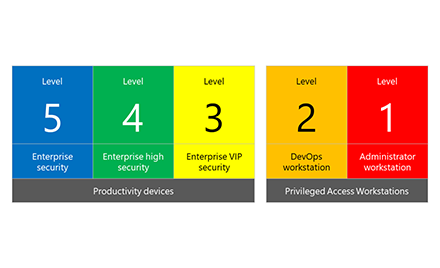 Over the years, Microsoft security teams have been working extremely hard to address these attacks. While delivering innovative solutions like Windows Defender Application Guard, which provides a safe virtualized layer for the Microsoft Edge browser, and Windows Defender Advanced Threat Protection, a cloud-based service that identifies breaches using data from built-in Windows 10 sensors, we are hardening the Windows platform with mitigation techniques that can stop exploits of newly discovered and even undisclosed vulnerabilities. As Terry Myerson reiterated in his blog post, we take our commitment to security innovation very seriously. A key takeaway from the detonation of zero-day exploits is that each instance represents a valuable opportunity to assess how resilient a platform can be—how mitigation techniques and additional defensive layers can keep cyberattacks at bay while vulnerabilities are being fixed and patches are being deployed. Because it takes time to hunt for vulnerabilities and it is virtually impossible to find all of them, such security enhancements can be critical in preventing attacks based on zero-day exploits. In this blog, we look at two recent kernel-level zero-day exploits used by multiple activity groups. These kernel-level exploits, based on CVE-2016-7255 and CVE-2016-7256 vulnerabilities, both result in elevation of privileges. Microsoft has promptly fixed the mentioned vulnerabilities in November 2016. However, we are testing the exploits against mitigation techniques delivered in August 2016 with Windows 10 Anniversary Update, hoping to see how these techniques might fare against future zero-day exploits with similar characteristics. In October 2016, the STRONTIUM attack group launched a spear-phishing campaign targeting a small number of think tanks and nongovernmental organizations in the United States. The campaign, also discussed in the previously mentioned blog post, involved the use of the exploit for CVE-2016-7255 in tandem with an exploit for the Adobe Flash Player vulnerability CVE-2016-7855. 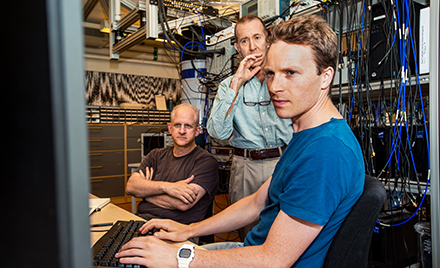 The attack group used the Flash exploit to take advantage of a use-after-free vulnerability and access targeted computers. They then leveraged the type-confusion vulnerability in win32k.sys (CVE-2016-7255) to gain elevated privileges. In this section, we’ll go through the internals of the specific exploit for CVE-2016-7255 crafted by the attacker. We will show how mitigation techniques provided customers with preemptive protection from the exploit, even before the release of the specific update fixing the vulnerability. Modern exploits often rely on read-write (RW) primitives to achieve code execution or gain additional privileges. 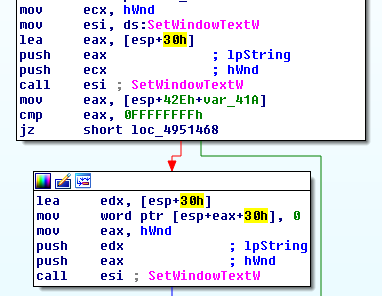 For this exploit, attackers acquire RW primitives by corrupting tagWND.strName kernel structure. This exploit method is a trend discussed in security conferences and visible to those who investigated actual attacks. For example, we detailed similar findings in a presentation about the Duqu 2.0 exploit at Virus Bulletin 2015. By reverse engineering its code, we found that the Win32k exploit used by STRONTIUM in October 2016 reused the exact same method. The exploit, after the initial Win32k vulnerability, corrupts tagWND.strName structure and uses SetWindowTextW to write arbitrary content anywhere in kernel memory. The exploit abuses this API call to overwrite data of current processes and copy token privileges of the SYSTEM. If successful, the exploit enables the victim process—iexplore.exe, in this example—to execute with elevated privileges. To mitigate the Win32k exploit and similar exploits, the Windows Offensive Security Research Team (OSR) introduced techniques in the Windows 10 Anniversary Update that prevent abusive use of tagWND.strName. This mitigation performs additional checks for the base and length fields, making sure that they are in the expected virtual address ranges and are not usable for RW primitives. In our tests on Anniversary Update, exploits using this method to create an RW primitive in the kernel are ineffective. These exploits instead cause exceptions and subsequent blue screen errors. With the upcoming Windows 10 Creators Update, Windows Defender ATP introduces numerous forms of generic kernel exploit detection for deeper visibility into targeted attacks leveraging zero-day exploits. Technical details about the enhanced sensor will be shared in a forthcoming blog post. As early as June 2016, unidentified actors began to use an implant detected as “Henkray” in low-volume attacks primarily focused on targets in South Korea. Later, in November 2016, these attackers were detected exploiting a flaw in the Windows font library (CVE-2016-7256) to elevate privileges and install the Henkray backdoor on targeted computers with older versions of Windows. The font samples found on affected computers were specifically manipulated with hardcoded addresses and data to reflect actual kernel memory layouts. This indicates the likelihood that a secondary tool dynamically generated the exploit code at the time of infiltration. This secondary executable or script tool, which has not been recovered, appears to prepare and drop the font exploit, calculating and preparing the hardcoded offsets needed to exploit the kernel API and the kernel structures on the targeted system. Through deep forensic inspection of the binary data found in samples, we extracted all the hardcoded offsets and ascertained the kernel version targeted by this exploit: Windows 8 64-bit. The font exploit uses fa_Callbacks to corrupt the function table and achieve initial code execution. The callback is called from the CFF parsing function. The following snippet shows a corrupted ftell pointer to a nt!qsort+0x39 location in kernel code. The following snippet shows the code that calls the corrupt function pointer leading to a kernel ROP chain. When the corrupted function is called, the control jumps to the first ROP gadget at nt!qsort+0x39, which adjusts stack pointer and initializes some register values from stack values. After the first gadget, the stack points to a kernel ROP chain which calls to ExAllocatePoolWithTag call to reserve shellcode memory. 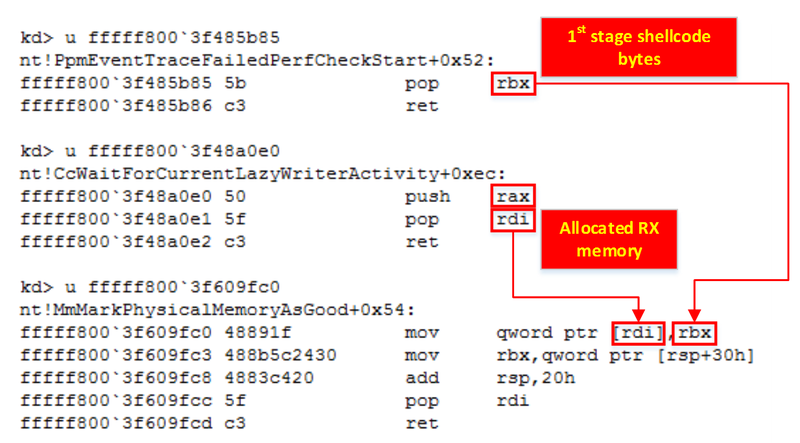 Another ROP gadget will copy the first 8 bytes of the stage 1 shellcode to the allocated memory. The stage 1 shellcode is very small. Its main function is to copy the main body of the shellcode to newly allocated memory and run them with a JMP RAX control transfer. The main shellcode runs after the copy instructions. The main shellcode—also a small piece of code—performs a well-known token-stealing technique. It then copies the token pointer from a SYSTEM process to the target process, achieving privilege escalation. Both the SYSTEM process and target process PIDs, as well as certain offsets for the kernel APIs needed by the shellcode, are hardcoded in the font sample. When opening the malicious font sample on Windows 10 Anniversary Update, font parsing happens completely in AppContainer instead of the kernel. AppContainer provides an isolated sandbox that effectively prevents font exploits (among other types of exploits) from gaining escalated privileges. The isolated sandbox considerably reduces font parsing as an attack surface. Windows 10 Anniversary Update also includes additional validation for font file parsing. In our tests, the specific exploit code for CVE-2016-7256 simply fails these checks and is unable to reach vulnerable code. While fixing a single-point vulnerability helps neutralize a specific bug, Microsoft security teams continue to look into opportunities to introduce more and more mitigation techniques. Such mitigation techniques can break exploit methods, providing a medium-term tactical benefit, or close entire classes of vulnerabilities for long-term strategic impact. In this article, we looked into recent attack campaigns involving two zero-day kernel exploits. We saw how exploit mitigation techniques in Windows 10 Anniversary Update, which was released months before these zero-day attacks, managed to neutralize not only the specific exploits but also their exploit methods. As a result, these mitigation techniques are significantly reducing attack surfaces that would have been available to future zero-day exploits. By delivering these mitigation techniques, we are increasing the cost of exploit development, forcing attackers to find ways around new defense layers. Even the simple tactical mitigation against popular RW primitives forces the exploit authors to spend more time and resources in finding new attack routes. By moving font parsing code to an isolated container, we significantly reduce the likelihood that font bugs are used as vectors for privilege escalation. In addition to the techniques mentioned in this article, Windows 10 Anniversary Update introduced many other mitigation techniques in core Windows components and the Microsoft Edge browser, helping protect customers from entire classes of exploits for very recent and even undisclosed vulnerabilities. For effective post-breach detection, including cover for the multiple stages of attacks described in this blog post, sign up for Window Defender ATP. 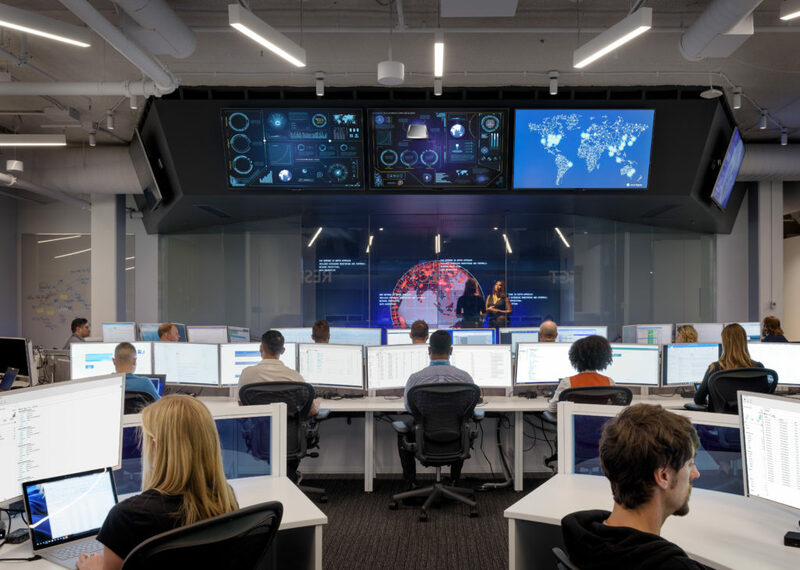 The service leverages built-in sensors to raise alerts for exploits and other attack activity, providing corresponding threat intelligence. 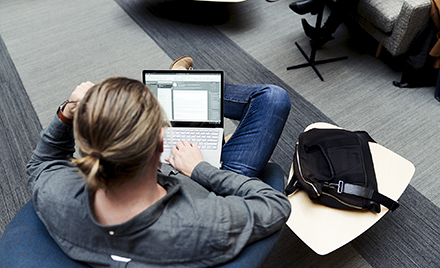 Customers interested in the Windows Defender ATP post-breach detection solution can find more information here. Microsoft would like to thank KrCERT for their collaboration in protecting customers and for providing the sample for CVE-2016-7256. Jan 18, 2017 – Corrected the spelling of Henkray backdoor.